Like Replace Hyperlink, this is a global search and replace, but for Shapes. NOTE: You must read and accept all of the statements before proceeding. 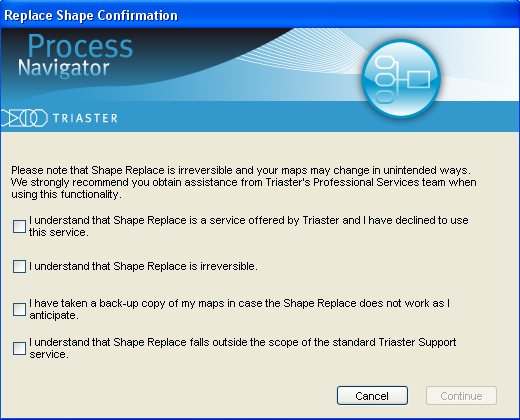 If you do not agree with any of these statements, you will need Triaster to perform the shape replace for you. 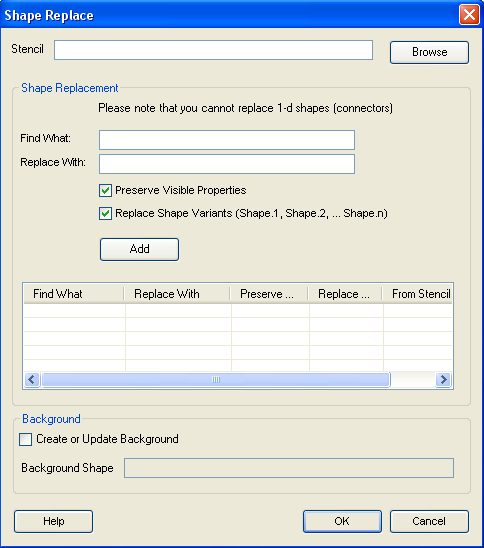 The interface requests details for the stencil to be used, ‘Find What’ and ‘Replace With’, and has an option to preserve visible properties. Once the details have been input select the ‘Add’ button – this will populate the find table with the details entered. Multiple shapes can be replaced at the same time by adding details for each specific shape. Process Navigator will then open each map in Visio and perform the changes and save them automatically. This may take some time if you have selected a large number of maps.